Toyota to make TRD and AWD standard for all models? Home » Cars » Toyota to make TRD and AWD standard for all models? If you’ve noticed the increasing number of Toyota TRDs recently, just know that it’s no coincidence. In an interview with AutoGuide at the Los Angeles Auto Show, Toyota said that it is considering adding a performance-oriented model to the entire family. Contrary to the common thinking, future TRD-badged Toyotas won’t simply be a standard model with slapped-on body kit. The most recent model to receive the TRD touch is the 86 TRD Special Edition, albeit without any enhancements made to the engine. Apparently, Hollis hinted that a Corolla TRD is pretty much confirmed, which makes sense considering its more sophisticated Toyota New Global Architecture (TNGA) GA-C platform. The Corolla Hatch will even compete in the 2019 Kwik Fit British Touring Car Championship, which speaks volume of TNGA’s capabilities. Could Toyota finally give the Civic Si or, more interestingly, the Civic Type R a run for its money? Only time will tell. For now, Hollis said the Corolla TRD – which was a SEMA concept that received numerous positive feedbacks – is definitely being considered. “It’s not in the plans yet, but there’s intention and development happening,” he said. Is this the rumoured Corolla Hybrid hot hatch? Maybe, maybe not. An example of this is with the 2019 Prius facelift – it’s now available with an electric all-wheel drive system that features a separate high-output motor to drive the rear wheels. It engages automatically when pulling away up to 10 km/h, and in low-grip conditions will operate at speeds of up to 70 km/h. The system is identical in operation to the E-Four system found in Japan. “We’re taking each model and we’re giving more choices for the consumer,” Hollis said, adding that TRD and AWD models are a smart way to do that. What do you think? Are you excited for what’s to come? Toyota Motor North America seems to be rather oblivious to the direction from his HQ. 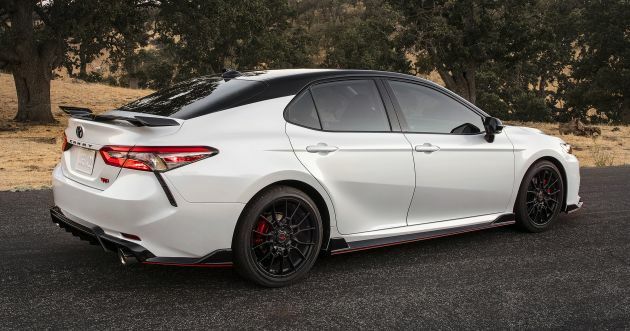 TRD is no longer the “sporty” arm but was replaced by Gazoo Racing. In the rest of the world, TRD branding have been reduced to a sticker and bodykit supplier. Yes bring back the TRD badge and dump the silly Gazoo Racing monicker! Whatever Toyota is developing, Malaysian not getting it. Thanks to UMW Toyota Motor Malaysia.